Good Smile Company Tenshi (Ascii Media Works) - Tenshi no Doki Doki! It's been a little while since last time, looking at my last photo shoot that would be just a week under two months. Why the long gap? Well, the primary reason is simple, I was waiting for this awesome, cute, lovely figure. 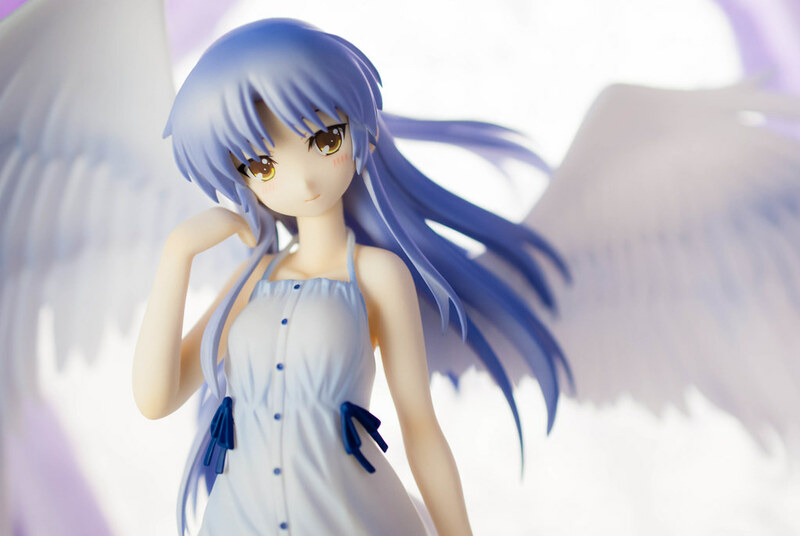 Good Smile Company and Ascii Media Work's Tenshi from Angel Beats! We all know who the lovely Tachibana Kanade, as she is sometimes known, is right? 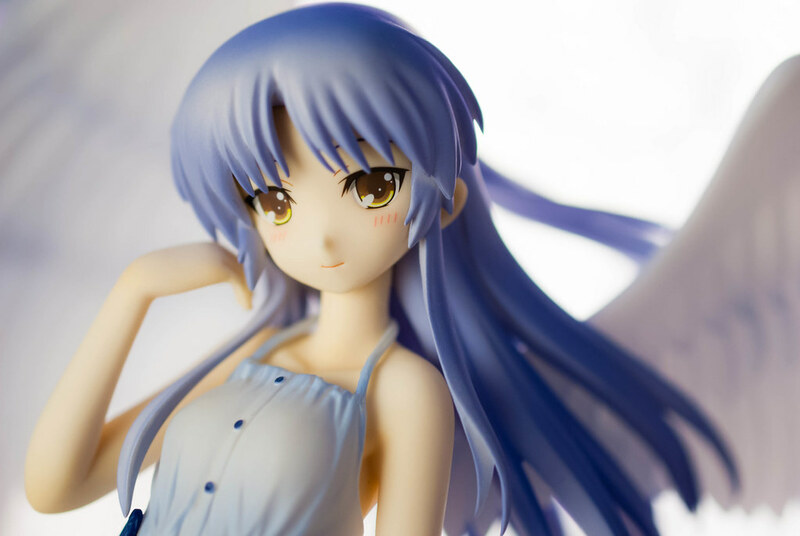 Lovely mysterious possibly angelic, at least at first anyways, girl whose actions drove the plot of Angel Beats for a while. She sure was nice, favorite girl of the show for me and fairly popular that Good Smile Company would go on to make this figure even after so many years since the show ended. This is actually the first scaled figure I have received this year all thanks to the factory sharing debacle with GSC and Alter. I wonder when will I get those two Alter figures I have on order, the vague "after May" release is kinda worrisome. Then you had the figmas from Max Factory getting delays not one but two or three months some getting delayed more than once. This year getting stuff on time or at least with the usual one month delays seems to be just not happening at all. At least from GSC and their umbrella and Alter. 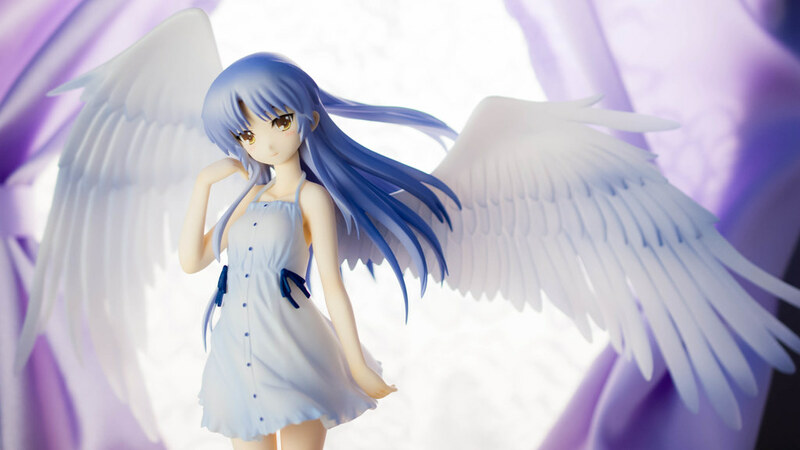 Which is why I'm actually quite surprised this Tenshi was released on time, I suppose being an exclusive helped. This figure was sold exclusively through GSC's web shop and Dengikiya, luckily enough ordering through the GSC shop made it easier and cheaper for people to get a hold of this figure. Even more so if you went for group orders and all that jazz. Except that... 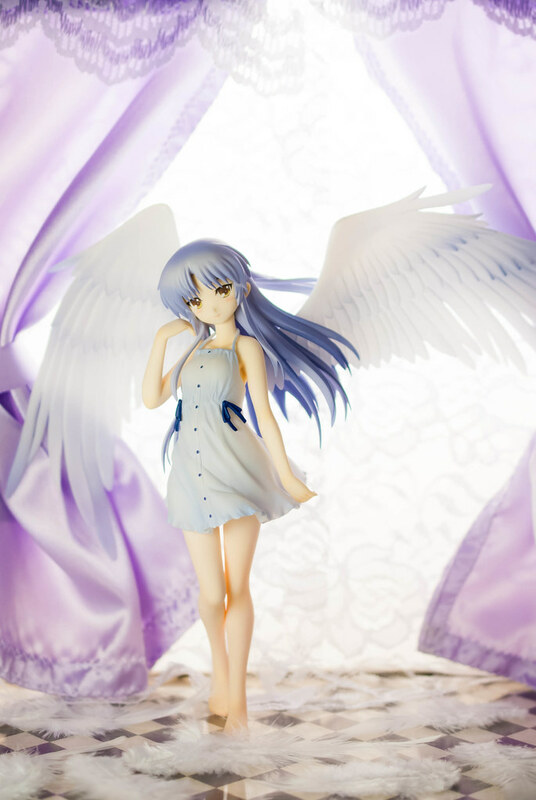 I... was not one of those people, since GSC didn't exactly announce they were gonna sell Tenshi through their shop I got it through a proxy. I ended paying quite a bit more thanks to the mark up, more expensive shipping costs and paying up front when the Yen was much stronger. Even if I wanted to just cancel and order through the GSC shop my choice of proxy had a 15% cancellation fee which would negate any savings. So, GSC announce right away when you are selling things through your shop ok? 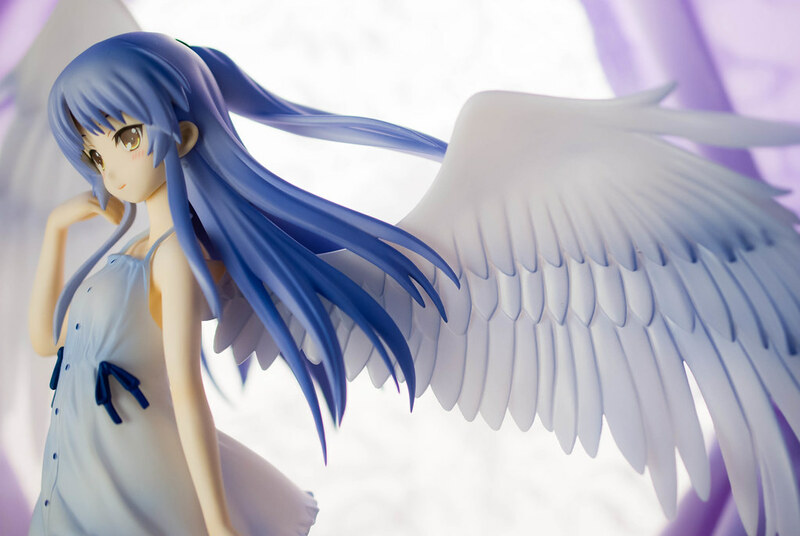 Some of you might remember but this is actually GSC's second Tenshi, the first came out a few years back. 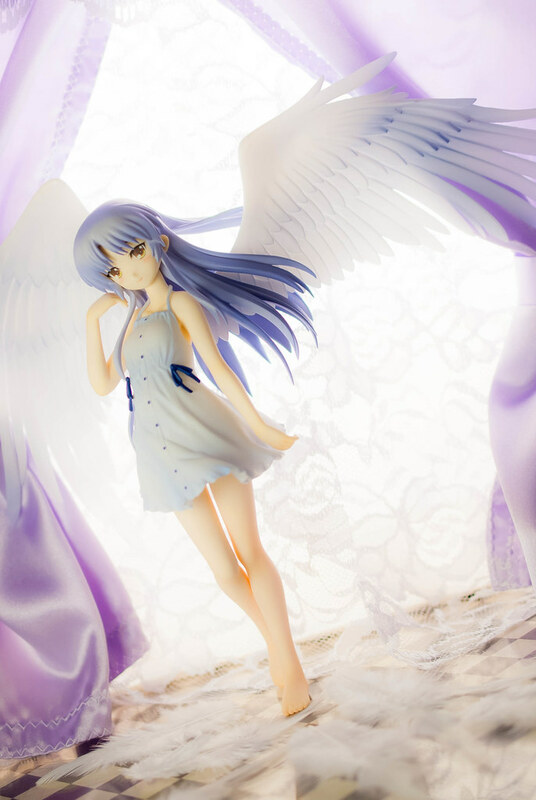 That original Tenshi caught my interest since it was one of the figures GSC used 3D modeling in an effort to save on productions cost for the figure. True enough that did reflect in a slightly lower than usual price for the figure. This figure on the other hand did go for a straight 8000 yen coupled with GSC's flat shipping that was at least 10K a pop. If you were like me who got it through a proxy even more. To be honest I think this is a very beautiful figure but also a bit over priced. One of the reasons I really liked this figure has to be it's most noticeable element. 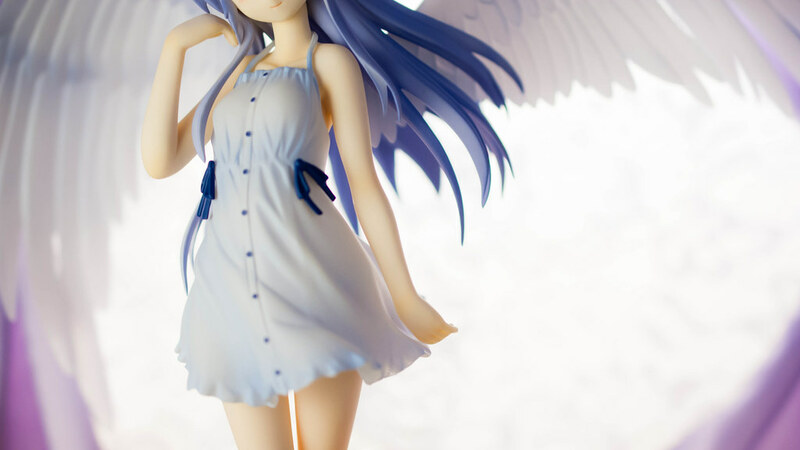 Some figures sure are visually commanding to me, Tenshi is one such figure. Her wings just draw your eyes to them, when I was taking these pictures I couldn't help but to keep glancing at them. Good Smile, being Good Smile did their usual craftwork and the wings certainly look the part. The variation on the feathers, the gradient in the coloring all make for a great looking effect. 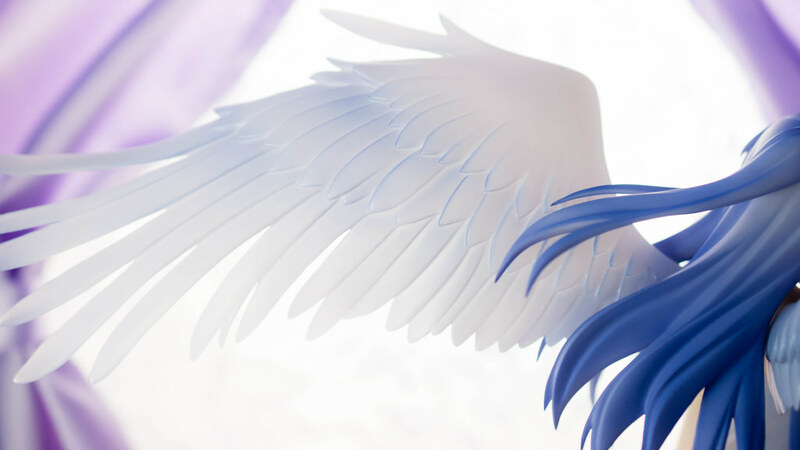 Compared to GSC's original Tenshi's these wings are way sturdier, those felt like cheap plastic in my opinion these feel like nice soft PVC. There were also the well known issues with the pegs that resulted in a very flimsy hold that would make with the slightest of touches. 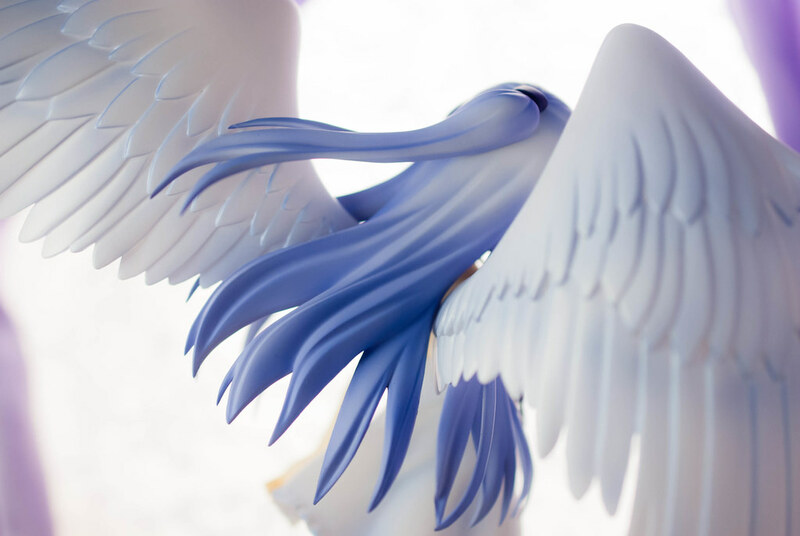 These wings are easily and securely attached to Tenshi's upper back, so securely in fact that when I was putting away the figure I was afraid I would end up snapping the peg. As for the rest of the figure, it looks the part. 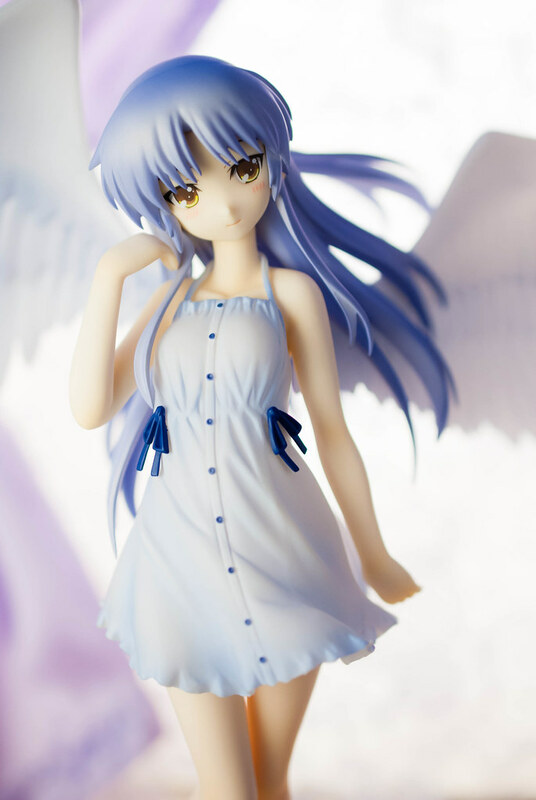 Tenshi carries a nice serene expression befitting of her imagery and personality, her modest smile and slight blush just make for absolutely lovely package. Add to that her hand as if flicking her hair adds a nice casual air to the whole image for me. The hair looks appropriately good with several individual strands, the shading with the sculpting adding some nice volume to it. Her dress has some nice details, rather than being some plain boring featureless piece of white cloth the blue ribbons and buttons accentuate the overall color scheme. The creases of the clothing and the shading add nice depth and features to it. When I looked at the figure in person, the dress felt like it was appropriately flimsy for this type of imagery. 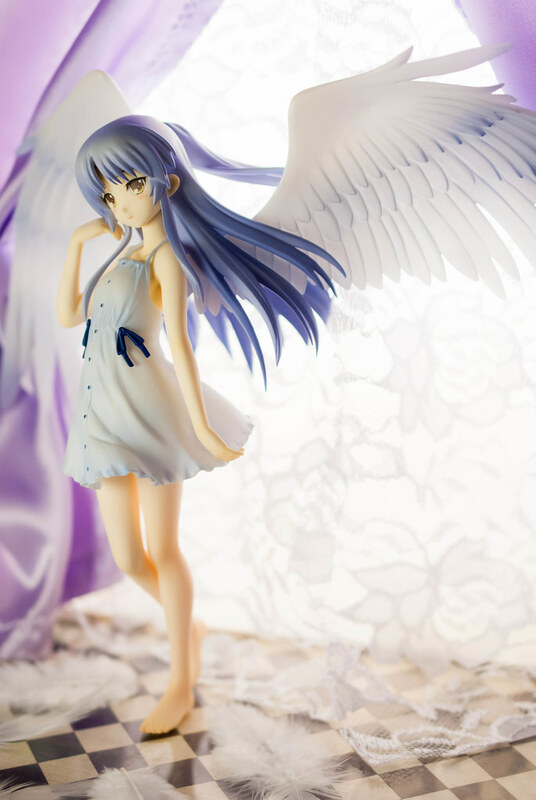 Interestingly enough, the dress is not sculpted into the figure but is instead a separate piece with Tenshi's body sculpted normally underneath. I should mention you can also remove the head from body. You might be thinking, the dress is can be cast off. The answer to that is both yes and no, you can if you make some permanent alterations to it along one of the seams, but you might not be able to get the dress on properly again. You can do it, but it seems it wasn't really intended to making wonder why GSC went and did this separate two pieces in the first place. 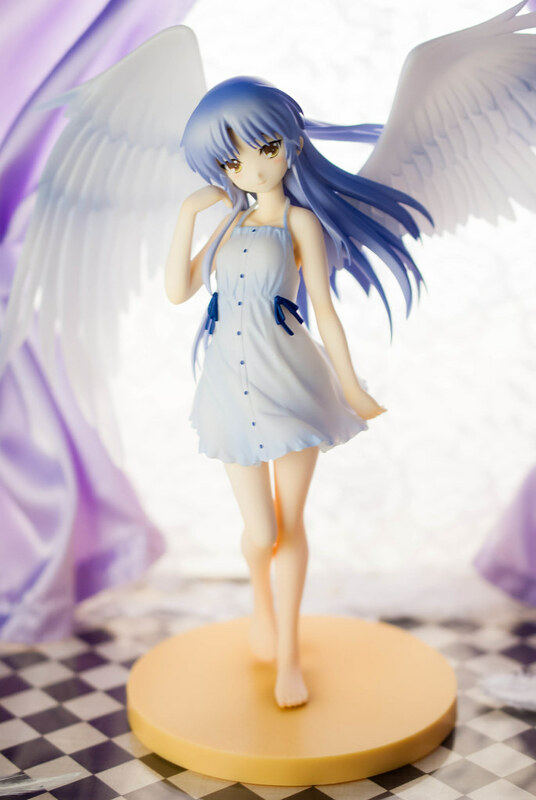 Moving down along the figure, Tenshi has some nice slim and girlish legs and her bare feet are so cute. If you are the kinda person who is into all of that stuff this should tickle your fancy even if she is no Erio or Menma. Quite simply from head to toe this is one very beautiful figure, she will be a mainstay in my collection. 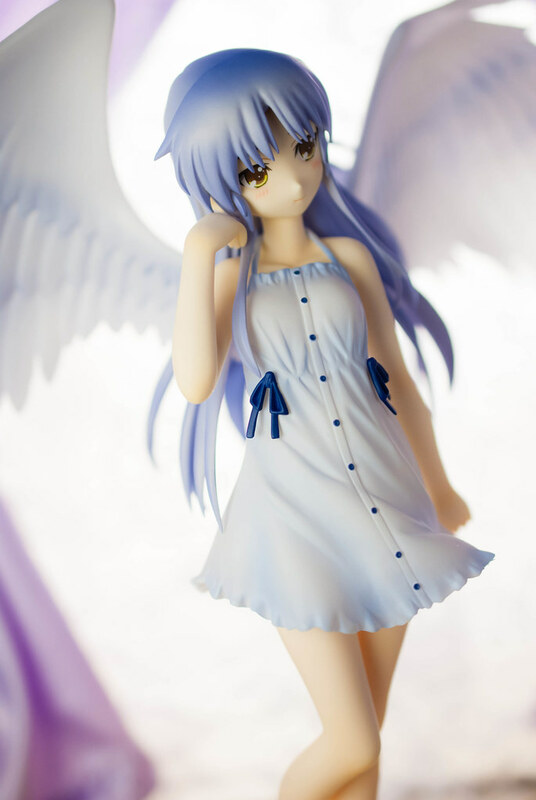 Tenshi will be one of those figures that I probably wont ever sell. There truly is nothing for me to complain about besides the price even then as an exclusive figure that comes with the territory I suppose. Except, for one thing, one part of the figure that I have omitted, do you know what that is? Sigh... why GSC? Why would you do something like that?! Good Smile Company is the figure manufacturer that has brought us things like Bakemonogatari's Shinobu with a nice elaborate base reflecting the illustration she was based on. Unique, full of detail, makes the figure stand out so much more. GSC didn't have to make it, they could have done something simpler and easier but they went the extra mile. Which is why this base bothers me so much, I know GSC can do much better, even if it's not as elaborate as with Shinobu. This base is supposed to be what I believe a sandy beach upon which Tenshi is walking. Honestly this doesn't look any better than the Beach Queen's iconic bases. Not to look down on Beach Queen's but those are 3,000 yen figures, so expectations are of course lower. Yet GSC gave us just that base for a figure that cost twice as much and was an exclusive to boot, quite simply I expected better and not some cheesecake! Besides that silly base, which sadly I can't display the figure without, this is one of my most well liked figures in my collection since she has arrived. As a fan of the character it is perfect in both looks and personality. 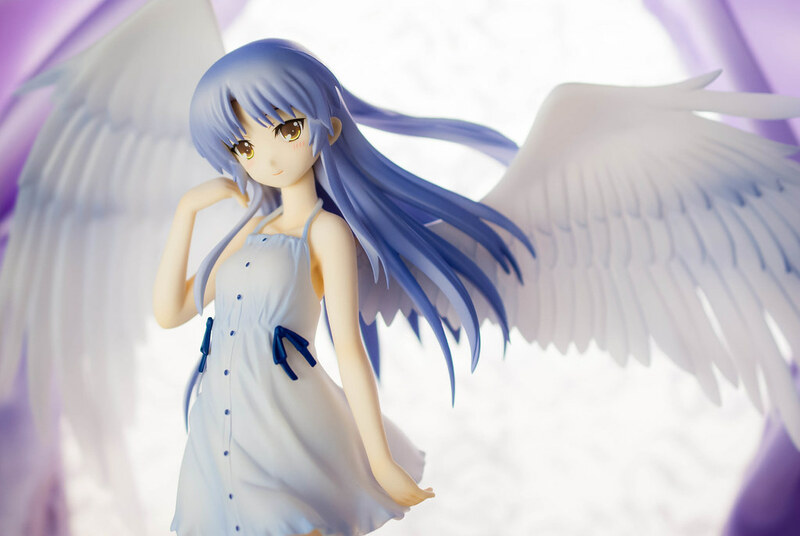 It is a great complement to my original Tenshi figure and I'm glad I own both.